We can say with certainty that TradeBuilder - Classic Edition is the most comprehensive strategy building framework in the world. It enables traders to develop their unique, fully-customized trading strategies from ground-up, and identify market opportunities that established and prepackaged trading systems cannot detect. Follow trend or scalp or do both by customizing 34 powerful, fully integrated indicators, and their 190+ parameters. If you need something simpler or cheaper, you may wish to consider TradeBuilder Core. Add existing or develop new profitable strategies by combining and compounding indicators for millions of unique possibilities. All alerts and signals (including arrows) issued by TradeBuilder Classic never repaint, as they are confirmed by the program beforehand. 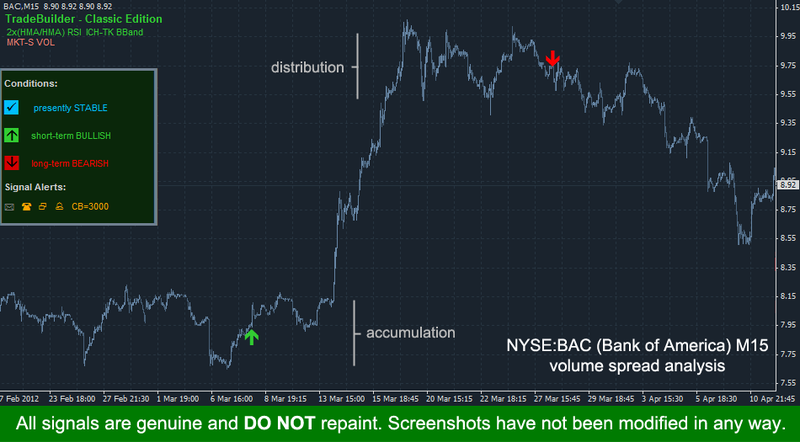 What you see on screenshots is representative of actual, live indicator performance. Eliminate market noise and trade, both, ranging and trending markets by applying Classic's built-in filter indicators. Trade volatile and swinging markets with the fully integrated Overbought/Oversold Strategy mode. Validate each signal with an advanced, built-in, Market Monitor by keeping track of immediate market bias, in addition to short and long term trend. Incorporate the Market Monitor module directly into your trading by applying it as a filter, and avoid consolidating/choppy markets. Apply your strategies to any market: FOREX, futures, CFDs, stocks, indices. TradeBuilder Classic's ush-to-Phone Notifications allow you to forward all signals to your smartphone in real-time. Supported platforms: iOS (iPhone, iPad) and Android (4.0 or higher). Personalize pop-up and email alerts by replacing default buy/sell text with messages relevant to your strategy. Fully customize the appearance of signals to fit any template: choose from 9 different types, and hundreds of colors. Keep track of all settings by consulting Classic's on-screen Visual Dashboard module. Give each configuration a name, and easily remind yourself of your strategy's target market, time frame, or trading rules. Install TradeBuilder in seconds via built-in installer. Get a lifetime upgrade license with each purchase of TradeBuilder Classic version 10 (or higher), including all future enhancements and features. New integrated indicators are added on biannual basis. Shape Classic's development by providing feedback and voting on indicators and features you would like to see integrated in the future. Discuss and exchange strategies with our chief algorithm architect, Marko Nikolic, and other users via TradeBuilder Forums (full complimentary membership). If you don't have time or patience to build your own strategy, then download one of many TradeBuilder Classic market templates from the user community forum. Templates are ideal for traders looking to jump straight into market action or to use them as base for their own strategy creation. These are setups uploaded by Marko Nikolic and other users, updated and added on frequent basis. They cover numerous different trading styles (from trend to range), time frames, chart types, and markets. Whatever your trading strategy involves, you are likely to find a template for it. Versions 5-10 of TradeBuilder Classic have been the most significant upgrades circa indicator's inception back in 2009. Newly added features include 34 all-new integrated indicators, a new powerful auto-filter based on the overhauled Market Monitor module, and nearly 70 new compoundable components. Altogether, TradeBuilder Classic 2017 Edition features 34 integrated indicators, and 190+ compoundable components, making it one of the most comprehensive technical analysis tools on the market today. Tradebuilder - Classic Edition is constantly expanding in functionality and capability. Below are some of the recently added features. Envelopes are built using 2 deviated moving averages (upper and lower), with deviation being measured in percentage terms. This means lower time frames (under 1 hour), with their lower daily vertical range require lower Deviation values (under 1%) while higher time frames (over 1 hour) require higher Deviation values (over 1%, realistically in the 3-5% range). Of course, Deviation input is up to the user - their strategy and risk appetite. Indicators based on price boundaries, such as Envelopes and Bollinger Bands (also available in TradeBuilder) encompass price action most of the time. When price action occurs outside of these boundaries it represents a statistical extreme - one which can be applied as buy/sell trigger in trend following and scalping strategies. Envelopes can be used within a strategy in many different ways. One of the most common is using upper envelope pierce by price as bullish signal and lower envelope pierce as bearish signal. The space between upper and lower acts as a buffer or filter against choppy or consolidating markets. Piercing of these bounded statistical extremes represents strength in the market - either trend, momentum, or both. By default, TradeBuilder will issue a buy signal when price crosses over upper envelope and sell signal when price crosses under lower envelope. The reverse happens when Envelopes are active in Overbought/Oversold (OB/OS) mode – buy when lower envelope crossed, sell when upper envelope is crossed. The Euro/Dollar (EUR/USD) 1-hour chart below shows TradeBuilder Classic with just the Envelopes indicator active. As trend gains strength it pierces upper/lower envelopes, often marking an onset of bullish/bearish trend. Metatrader's Envelopes indicator was added to the chart for demonstration and is not required for operation of TradeBuilder. Envelopes in OB/OS mode are best applied in two scenarios: scalping and exit signals. Higher Deviation values represent higher probability of price reversing once the deviated moving averages are hit (unless market is strongly trending). As such, traders often use price penetration of upper envelope as a bearish reversal signal and penetration of lower envelope as bullish reversal signal. With take profit, stop loss, and/or trailing stop in place this pinballing between upper and lower envelopes constitutes a popular scalping strategy. The Dollar/Yen (USD/JPY) 5-minute chart below shows TradeBuilder Classic with its global scalping mode enabled. 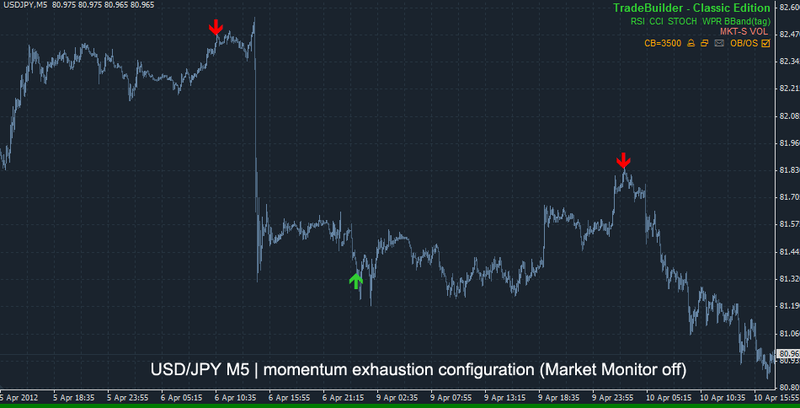 The only active integrated indicator is Envelopes but because of scalping mode, signal direction is reversed. We inputted a considerably higher Deviation value between upper and lower envelopes to ensure that price has a higher probability of reversal upon crossing them. On Balance Volume (OBV) is a cumulative, running total of market volume incorporating, both, positive (inflow) and negative (outflow) investor interest. The result is an oscillator that measures buying and selling pressure of a traded market. Since large component of OBV is reliant on tick volume, the indicator is best used as a filter within a broader strategy setup. Coupling OBV with one or more of TradeBuilder's price-derived indicators (RVI, RSI, Bollinger bands, PSAR, Moving Average Cross, etc.) allows traders to create a strategy that weighs price action with underlying volume. This weighing can help avoid unnecessary, unanchored price criss-crossing and thrusts associated with indecisive, ranging markets. Since OBV essentially measures supply/demand, the oscillator can be used to identify divergence between it and price action, indicating overbought or oversold conditions. Screenshot below shows one such example. USD/CAD 5-minute chart. Signals are compounding the following TradeBuilder components: Ichimoku Kinkō Hyō (ICH plus modifiers), Bollinger Bands (BBand), Average True Range (ATR), On Balance Volume (OBV), Accelerator Oscillator (ACC). EUR/USD 30-minute chart. Signals are compounding the following TradeBuilder components: Double HMA Cross (HMA/HMA), Parabolic Stop-and-Reverse (PSAR), Average Directional Index (ADX), On Balance Volume (OBV), Accelerator Oscillator (ACC). This is the third Bill Williams technical analysis tool available in TradeBuilder Classic - the others are Alligator and the related Gator Oscillator. As indicative by its name Accelerator Oscillator tracks acceleration (positive and negative) of price action. We incorporated two sets of trading rules into Classic - one envisioned by Bill himself, the other popularized by modern technical analysts. Bill's rule involves strictly following the color of the oscillator - regardless of whether the oscillator bar is above or below 0. Buy signal issued when Accelerator Oscillator curve turns green - that is, it stops declining and starts advancing. Sell signal issued when oscillator curve turns red - it stops advancing, and starts declining. Popular strategy - the Naught Cross. This is a pretty straightforward 0-level crossover strategy. It compounds the effects of Bill's rule on top of the naught cross. Buy issued when oscillator crosses the 0 mark from below (effectively referred to as positive market driving force) and if bar is green. Sell issued when oscillator crosses the 0 mark from above (effectively referred to as negative market driving force) and if bar is red. Below is a demonstration using just a Double MA Cross to generate signals - first without, then with the Accelerator Filter applied. In total, 2 noisy signals were filtered out. Not perfect but certainly better than the original Double MA setup - now try pairing it with Classic's other 30 integrated indicators. The Relative Vigor Index (RVI) is an 2-curve oscillator intended to measure price movement "energy". It does so by tracking the distances between market open and close prices over a specified period of time. Values above 0 indicate an up-trending market while values less than 0 suggest a prevalence of sellers. John Ehlers (RVI inventor) suggests that the main line should be over signal line in an uptrend and under in downtrend. The Euro/Dollar (EUR/USD) 1-hour chart below, is a TradeBuilder Classic trend-seeking configuration based on the Relative Vigor Index, backed by the Double Moving Average Cross (Exponential/Smoothed), Money Flow Index, Ichimoku Kinkō Hyō, Force Index, and the Volume filter. The phone icon indicates that Push to Phone notifications are enabled. The Money Flow Index (MFI) is an oscillator which considers, both, price and volume in an attempt to gauge buying versus selling pressure. MFI can be useful in determining whether accumulation or distribution is taking place in the market. Rising values, or values above 50 indicate more buying pressure while falling values or values under 50 indicate sellers' dominance in the market. The following Dollar/Loonie (USD/CAD) 4-hour chart example demonstrates MFI's capabilities. As previously mentioned, MFI utilizes volume to calculate buying or selling pressure for a target market. When compounded with TradeBuilder's pure momentum-based oscillators, like the Relative Strength Index, the duo produces very solid, and timely trend-following signals. Before being incorporated into Classic, Ichimoku was one of the most requested indicators - and with good reason. It is readily used by leading technical analysts to create powerful strategies, oftentimes with leading signals. Ichimoku's key trait is its versatility, which allows the user to construct many types of strategies oriented around its 3 lines (Tenkan, Kijun, Senkou) and the trend-following cloud (Kumo). In essence, this integrated indicator represents several indicators in one. Multiple Ichimoku strategies, based on actual, institutional rules were programmed directly into TradeBuilder Classic. Tenkan/Kijun Cross: based on a cross between Tenkan Sen (fastest moving average, known as conversion line) and Kijun Sen (trailing moving average, known as the base). The cross over/under of Tenkan through Kijun is the first component of an Ichimoku Kinkō Hyō system to signal a change in trend. Long signal issued when Tenkan crosses over Kijun from below, and short when Tenkan crosses under Kijun from above. Kumo Trend: based purely on Kumo shape and direction. Long signal issued when Kumo is positive (the two Senkou lines form a cloud trending upwards, usually green in color); short signal issued when Kumo is negative (the two Senkou lines form a cloud trending downwards, usually red in color). This strategy makes an excellent signal filter. Chikou Span Consideration: Chikou line is current Price level shifted 26 periods into the past, and is meant to be an indicator of trend. If Chikou is above the Price level 26 bars ago, then the sentiment is bullish, and a long signal is issued. If Chikou is below the Price level 26 bars ago, then the sentiment is bearish, and a short signal is issued. You can use more than one Ichimoku strategy simultaneously and compound their effects - in addition to compounding them with the other 30 TradeBuilder integrated indicators. Using all 4 Ichimoku strategies together creates a complete Ichimoku Kinkō Hyō trading system, used by technical analysis experts such as Goichi Hosada - the Japanese analyst who invented the system. The Dollar/Yen (USD/JPY) 5-minute chart below shows application of all 4 Ichimoku Kinkō Hyō strategies within TradeBuilder Classic. Volume is one of the most effective filters in technical analysis, and many strategies, such as Volume Spread Analysis (VSA) are oriented purely around it. The theory holds that the more volume behind a trending price move, the more likely the price direction will hold. Think of a moving train. If the train is fully loaded with cargo, it will take a lot more effort to stop it than if it were empty. If a price move up or down is backed by large volume, the price will likely continue moving in that direction for a while longer before reversing. Another useful feature of volume is its ability to filter price thrusts. Normally, volume is roughly proportional to bar size, but certain thrusts (spikes in price) contain little volume. Such pattern likely indicates a premature price move or possibly one without any real interest behind it, usually leading to price reversal. These are just two of many popular volume-based strategies. More can be found on the web or by searching our user community forum. By default, minimum volume parameter value is set to 0 (no filtering). You need to change this to a level you deem important in order to apply volume filtering to market action. Once you specify the desired level, only signals that occur at or above the specified amount of volume will be issued. The rest will be filtered. The following Dollar/Loonie (USD/CAD) 15-minute chart shows TradeBuilder following Smart Money. The Volume filter effectively filters consolidating, premature, and interest-lacking price action. Before incorporation of HMA, TradeBuilder's another much-requested feature was a new form of moving average. Since our development of TradeBuilder Classic is ultimately decided its users, we were happy to oblige. We went with Hull Moving Average because it is fast, adaptive, and sometimes leading in nature. The algorithm places greater emphasis on recent price action, without the over/under shooting effects (often in form of spikes) associated with other faster moving average types such as Linear Weighted. HMA is available as the 5th option (in addition to Simple, Exponential, Smoothed, Linear Weighted), directly within the Double and Triple Moving Average Cross components of Classic. You can mix Hull with other moving average types. For example, you could have a Triple MA Cross consisting of an HMA, Exponential, and Smoothed, using the HMA/Exp cross as a bellwether of short-term trend change, and HMA/Smoothed for tracking underlying trend. Whichever MA Type you select, the appropriate icon will appear in your Visual Dashboard (see below). The Aussie/Dollar (AUD/USD) 30-minute chart below demonstrates HMA's adaptability, speed, and harmony with the Volume filter (see previous paragraph). TradeBuilder Classic has had some form of market bias monitoring module circa version 3. However, version 5 completely revamps not just the algorithm behind the module (in fact, it introduces 2 new ones), but the visual interpretation as well, and even adds an option to incorporate the module directly into your TRADING, by using it as a filter (see Market Outlook Filter below). BULLISH - An underlying bull market has been detected. BUY signals issued during this period have a higher probability of succeeding. OVERSOLD - warns of market condition being oversold (underpriced). Selling is not recommended. OVERBOUGHT - warns of market condition being overbought (overpriced). Buying is not recommended. WEAK TREND - No significant trend bias has been detected. The market could be consolidating or simply ranging. Immediate term sub-indicator only indicates Upthrust (upward momentum exhaustion - buying not recommended) and Downthrust (downward momentum exhaustion - selling not recommended) market conditions, in addition to Safe (i.e. tradable). Trying to determine whether the immediate trend is Bullish or Bearish would be nonsensical, because of sub-indicator's extremely short-term nature (it only considers 1-5 upcoming bars). With version 5, each output/bias is now also accompanied by an arrow, indicating where the market is expected to go (up - long, down - short, sideways - ranging/consolidating). Classic's Market Outlook module identifies a bear market - frame color changes to yellow to emphasize the downtrend. Market Outlook module's background now paints different color to indicate aggregate market conditions. The module is painted red during extremely overbought or oversold market conditions; green during bullish, yellow/brown during bearish; and gray/blue if there is no clear direction or bias. Think of it as a committee of the 3 sub-monitors: if, for example, at least 2 of them agree on Overbought or Oversold conditions, the background will change from green to red, indicating caution against trend-based trades. The Market Outlook mode's output/bias can now be automatically applied to any TradeBuilder setup. The new filter ensures that long and short signals only get issued during times of higher probability (as calculated and diplayed by the module). For example, long (buy) signals would only be issued during Bullish conditions, but not Weak Trend or Overbought, and short (sell) only during Bearish conditions, but not Weak Trend or Oversold. The Market Outlook filter must be accompanied by a at least one other non-filtering indicator, such as Double MA cross, RSI, etc. The two Dollar/Swissy (USD/CHF) 5-minute screenshots below show TradeBuilder Classic compounding Double MA Cross, RSI, Stochastic, Ichimoku, Bollinger, ADX Strength, and Volume components. Top screenshot shows chart with the Market Outlook Filter disabled. Bottom demonstrates signal filtering once the Market Outlook Filter (short-term) is enable. Label "MKT-S" appears in the dasboard when the short-term Market Outlook filter is active. Similarly, "MKT-L" would be displayed if Market Outlook Filter's long term filtering were enabled, and "MKT-2x" if both long and short term filtering were selected. Force Index is mostly used as an effective market filter. However, it can also be used to trade contrarian signals via statistical extremes, based on Force's formula that considers both price and volume (or in Forex terms, up/down tick volume). Below is a recent USD/JPY M15 screenshot, featuring Classic running just the Force Index component in OB/OS Mode. 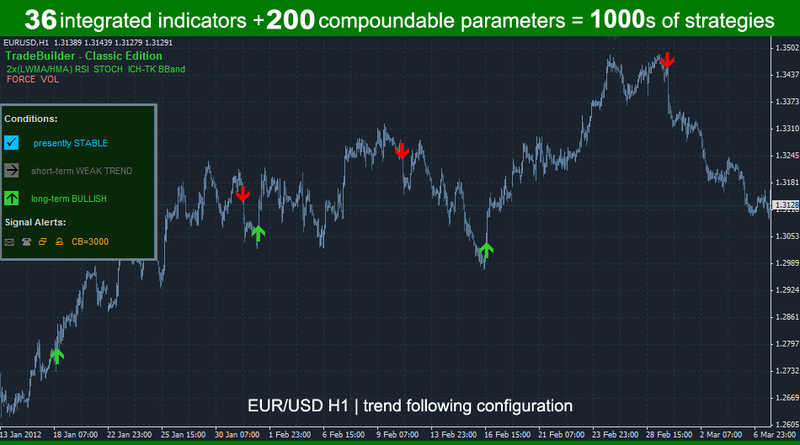 Activate other integrated indicators to compound their effects, and further improve signal quality. The Bollinger Bands component can now issue contrarian signals when its deviation bands are broken. This strategy (like most of OB/OS Mode) follows the laws of probability. With Bollinger, price action that pierces through extreme standard deviation bands (2 and higher or -2 and lower) stands a higher chance of retracing than continuing in that direction. To activate, set Overbought_Sold_On to true (activates TradeBuilder Classic's Overbought/Oversold Mode), IndBollinger to true (activates Bollinger Bands), and configure desired settings. The Cable (GBP/USD) 1-hour chart below shows the Bollinger OB/OS component in action, picking major turning points. An absolute must for trend-following traders. In contrast to double MA cross, the third moving average acts as a buffer against premature or false market moves. Buy signal is issued when MA1 (fastest MA) crosses MA2 (medium MA) and MA2 crosses MA3(slowest MA) from below. The opposite is true for the sell signal. The setup allows the slower, more trend-respective MA2/MA3 cross to act as filter for thrusts (volatility) and range-bound action often found on a simple double MA cross setup. Triple Moving Average Cross includes 3 modes. Leaving it at default setting makes Classic issue signals neutrally as per screenshot above. Setting it to Long optimizes it for long positions. As result, a long (buy) signal is issued on trend confirmation, but a short (sell) signal is issued as soon as the fastest MA crosses the slower two. The aggressive nature of the short signal ensures that you get out of your long trade at the first sign of trend change, maximizing your profit-taking ability while minimizing losses. The reverse occurs when setting mode to Short. Screenshot below illustrates it best. If you entered a trade on the short signal you would have received extra 80-120 pips of profit with short mode activated versus default or long. This is shown by the second buy arrow on the second screenshot being considerably lower. You could add 2 instances of Classic to the same chart and use one for Long trades and the other for Short. See Multiple Instance Strategy on our user community forum for more details. Demarker Technical Indicator is an oscillator developed by Tom Demarker for identifying high-risk buying or selling areas in a given market. It is a reliable tool for detecting periods of overbought/oversold market activity. TradeBuilder - Classic Edition allows you to take advantage of DeMarker OB/OS trading via built-in Overbought/Oversold mode (see second example). The first screenshot is a Pound/Dollar (GBP/USD) M5 setup compounding DeMarker with 2MA Cross, Williams %R, Parabolic SAR and ADX-strength. Since Demarker was developed with intention of avoiding high-risk conditions, it works harmoniously with other trend-seeking indicators. This template is included, free of charge, with each TradeBuilder Classic license. The following USD/JPY M1 setup demonstrates DeMarker in Overbought/Oversold mode, compounded with Stochastic Oscillator, Bollinger Bands and Average True Range. TradeBuilder's integrated Bollinger Bands indicator is trader's preferred tool when building strategies based on support/resistance. Furthermore, the algorithm is smart enough to issue only a single long or short signal while price lingers above and below an upper or lower band. It basically ensures you don't end up getting numerous signals of the same type as price wrestles with Bollinger band resistance (upper) and support (lower) lines. Example below is a Euro/Dollar (EUR/USD) M15 setup featuring compounded functions of Bollinger Bands, Parabolic SAR, and RSI integrated indicators. Examples and application of Bollinger Bands within TradeBuilder Classic can be found on our user community forum. Parabolic SAR strategies work on the technical principle of support/resistance breaking. This indicator is thus best suited for trend-following setups such as the Pound/Dollar (GBP/USD) M5 example below. The strategy shows TradeBuilder signals based on compounding of Parabolic SAR (0.002, 0.01), Stochastic Oscillator, and Double Moving Average Cross integrated indicators. The first generation of TradeBuilder introduced Stochastic overbought/oversold strategy. It proved so popular with traders in swinging markets that we decided to add RSI, CCI, Bollinger Band (via tag and reverse), and Williams %R versions of it as well. For best results try compounding multiple overbought/oversold supported indicators. Below are example screenshots of the Global OB/OS mode in action. The Euro/Dollar (EUR/USD) M5 setup below demonstrates capabilities of the ADX Strength filter when used in combination with other indicators, and the Overbought/Oversold Mode to isolate signals of only the highest probability. Left screenshot is a RSI+Stochastic setup, but with ADX Strength filter turned off. Right is the same setup with ADX Strength filter set to level 60. Williams' Percent Range (WPR) is one of the more reliable momentum indicators and is typically applied to gauge trend momentum as well as oversold/overbought conditions. Larry Williams himself often used it with moving averages. WPR works harmoniously with the other Classic indicators and opens up interesting strategy combinations, such as the one depicted in the screenshot below. Also included is the WPR Trend Strength Filter, which effectively filters out choppy market conditions and price thrusts. Euro/Dollar (EUR/USD) M30 setup compounding Williams' Percent Range, Triple Moving Average, Heikin Ashi Smoothed, and Force Index. MACD-Signal Distance Filter was added to Classic after we successfully tested its potential and capabilities as an effective ranging market filter. Its intended function is to detect and avoid periods of consolidation and low-volatility. This sort of price behavior is notorious for crippling a lot of strategies due to abundance of signals that form in range bound price channels. In the example that follows, on the left, we have a MACD strategy without any filters. Although the bear run banks many pips, the strategy eventually gets caught by choppy price action when market starts consolidating. On the right, we have the same chart and TradeBuilder setup but with MACD-Signal Distance filter set to 0.001. We don't promise or guarantee unrealistic returns. Instead, what we offer are software tools that enable investors and traders to build highly personalized, profitable strategies catered to their experience, trading style, target market, and money management. TradeBuilder - Classic Edition is comprised of 34 established and proprietary indicators (see list below), which, when used in combination, have the potential to build powerful, fully-customized trading systems. Thirty may seem like a large number to keep track of, however, they're fully integrated into TradeBuilder's visual dashboard, making their management - and your trading - efficient and intuitive. No more staring at the screen for hours, making sure all your indicator signals line up. Just launch TradeBuilder, setup an alert for your strategy, and go about your day. TradeBuilder can even push signals to your phone. With so many integrated indicators it may be difficult to remember which were applied toward your strategy. That is why TradeBuilder comes with a visual dashboard, which lists your strategy components as you select them, and remains constantly visible on the main chart for quick reference. Main indicators are drawn green, pink represents market filters, while selected alert options are drawn orange (gray indicates that alert option is inactive). TradeBuilder takes only a minute to install while its operation is as simple as drag-and-drop. Installing and updating the indicator: TradeBuilder includes an installation wizard, which automatically installs the indicator package in seconds. The same wizard also serves as an auto-updater for future upgrades. You no longer have to worry about which file goes where - just double-click and let the installer do the rest. Select any combination of indicators you would like TradeBuilder to utilize, and configure their conditions for a target market. In this example we selected the combination of Triple Moving Average Cross, RSI, ADX, Heikin Ashi, and Force Index for the Euro/Dollar (EUR/USD) market. Once these conditions are met, TradeBuilder will issue a signal via arrow, audio, and pop-up alert. All alerts are issued on confirmation - at the bar where a strategy condition occured once the period closes. TradeBuilder does not repaint. You may additionally set up Push-to-Phone Notifications and Email alerts. The first option forwards all TradeBuilder signals to your smartphone (iOS and Android) in real-time, while second delivers all signals right to your inbox. Push-to-Phone Notifications is a feature found in all Mnikolic Investment Technologies software. Push notifications allow you to trade signals generated by the desktop version of Metatrader 4 (onto which TradeBuilder is installed) without having to physically be next to the computer. Think of your desktop as a signal server, and your smartphone as a signal recipient. Once you set up TradeBuilder on the desktop, you can run it 24 hours and execute signals as they are sent to your phone – Metatrader 4 mobile hooks to your broker for order execution. Push-to-Phone Notifications is a reliable and fast way of receiving the signals while on the go. If you prefer more traditional methods, the e-mail forwarding functionality is also built-in. If you have concerns about your internet connection, may optionally install TradeBuilder on a Windows VPS server. We offer such service through our ChartVPS subsidiary, but there are many other VPS providers out there. Just make sure the VPS hardware is adequate (CPU, RAM) and that redundancy connections are in place (99.5% or higher uptime recommended). (optional) Use multiple instances of TradeBuilder, each with a different set of conditions, if your trading style involves using multiple strategies. For example, one instance could be configured for market scalping, another for longer term range trading, and yet another could serve as an early warning system for trend change. The three together form a more comprehensive trading system capable of anticipating many patterns of price behavior. Tradebuilder works well with trending and ranging markets. Most of the bundled indicators are programmed with filters capable of detecting and avoiding times of low liquidity and/or volatility. Furthermore, several of the indicators, including ATR, Volume, Gator Oscillator to name a few, are strictly dedicated to such purpose. Compare the two screenshots below. One is Triple Moving Average Cross, MACD, and RSI compounded setup. The other is the same setup with ATR Volatility Filter Applied. Note: Aside from TradeBuilder, you do not have to add other indicators to your charts while trading. We added them below for informational purposes only. Disclaimer: TradeBuilder - Classic Edition is a trading platform plug-in/indicator intended for analysis of markets. Its effectiveness is based on your input and experience, and as such, Mnikolic Investment Technologies (formerly Build-A-Signal Software) and Marko Nikolic are not responsible for any losses you may incur as result of using TradeBuilder - Classic Edition in your trading endeavors. See full disclaimer.